HÀ NỘI — The Vietbuild exhibition opened on Wednesday in Hà Nội, with more than 1,600 pavilions showcasing products at Việt Nam’s biggest construction exhibition. The five-day event is expected to draw nearly 200 domestic businesses, 45 joint ventures and some 160 foreign groups and enterprises from 18 countries and territories. The event provides a venue for businesses to display their latest products in the fields of construction, building materials, real estate and interior and exterior decoration. 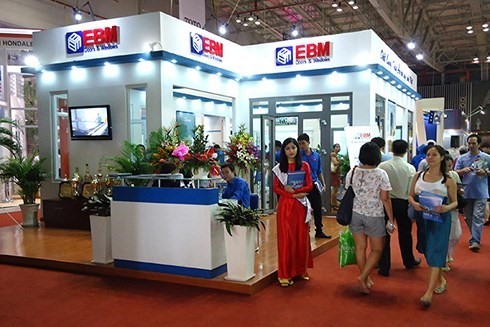 Representatives from the organising board said the construction material sector would face many difficulties in 2019, as many foreign companies will be able to export their goods to Việt Nam under free trade agreements. Therefore, domestic companies are striving to enhance their competitiveness and improve product quality to compete with foreign counterparts. Last year’s expo attracted 1,500 booths run by nearly 400 domestic and foreign companies.